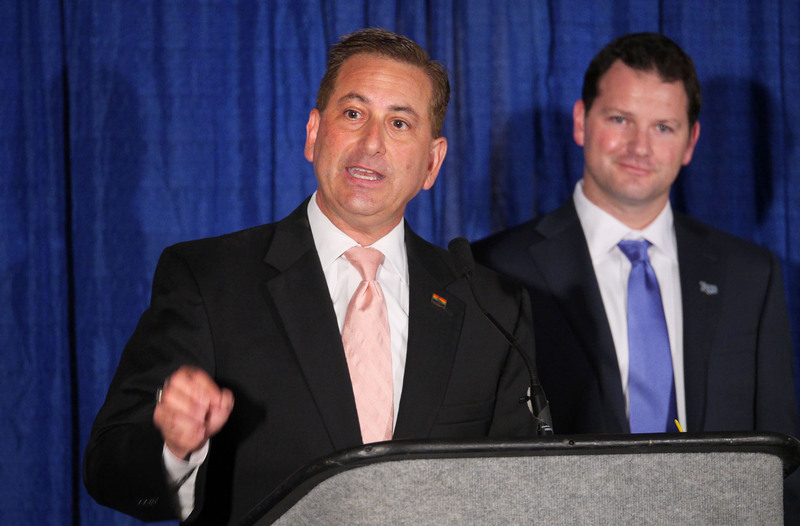 By Joshua Gillin on Tuesday, December 23rd, 2014 at 5:24 p.m.
St. Petersburg Mayor Rick Kriseman’s first year in office is coming to a close. When it comes to making progress on his campaign promises, Kriseman has seen both success and failure. PolitiFact rates promises based on outcomes, not intentions, so a promise not achieved is rated Promise Broken. The aim of PolitiFact's promise meter is to compare campaign rhetoric with what actually happens after a candidate takes office. We also track promises for Tampa Mayor Bob Buckhorn, Gov. Rick Scott and President Barack Obama. The broken promises on the Krise-O-Meter largely focus on the city’s shuttered pier, which Kriseman declared would be replaced by the end of 2015. Kriseman hasn’t met the deadlines he set for the project. Kriseman said a final pier design would be completed by September 2014, but the schedule hit snags from the start. His Pier Working Group, charged with compiling a list of desired features for a new or renovated pier, was supposed to present findings by April 2. But the group wasn’t even announced until May 1, so we called the missed recommendation deadline a Promise Broken. The panel spent the summer gathering feedback and shared recommendations in November. In the meantime, the city adopted a new schedule that set a design vote for 2015, with plans to finish construction in 2017. All that means Kriseman didn’t meet campaign promises to have a new design unveiled by September 2014 and a new pier built by 2015. We rated both pledges Promise Broken. Kriseman’s fourth and final Promise Broken was about an entirely different program, the city’s red light program. Kriseman promised to use red light cameras for public safety and not revenue. However, he cited budgetary concerns as a reason to end the program. But it hasn’t been all bad for Kriseman. For starters, he promised to do something many residents have wanted for years -- start a mandatory curbside recycling program. That will soon be a reality. After the City Council agreed to Kriseman’s plan, the process suffered through fits and starts during the year. No outside contractors wanted to take on the job of picking up recyclables from the city’s 80,000 single family homes. Kriseman’s answer was to get the city to take on the work itself. Just before Thanksgiving, the council voted unanimously to approve $4.1 million to buy blue recycling bins and another $2 million for six trucks. City sanitation workers will make biweekly pickups of recyclable refuse, paid for by an additional $2.95 on residents’ trash pickup bill. The program won’t start until summer 2015, but the plan has been put into action. We rated this a Promise Kept. Another turnaround has been in staffing the city’s Codes Compliance Assistance Department, which Kriseman promised to beef up by adding inspectors and making Codes Compliance a budgeting priority. The division monitors everything from signage to yard maintenance to abandoned homes. It has had 22 codes inspectors since 2007, when Mayor Rick Baker cut the department’s funding by 25 percent. In September, the City Council approved Kriseman’s fiscal year 2015 budget, which included more than $160,000 for three more inspectors. That means there are now 25 inspectors, the first increase in the department in three administrations. We rated this a Promise Kept. Time will tell if Kriseman will be able to keep some of his other promises, especially those that concern the city’s dealings with the Tampa Bay Rays baseball team. Kriseman pledged to protect St. Pete taxpayers in negotiations with the Rays and to require the Rays to pay a fee to look elsewhere. Both promises are now rated Stalled, because the City Council on Dec. 18 voted down an agreement Kriseman hammered out that would let the Rays look for a new stadium location outside the city limits. That’s a setback for Kriseman’s goals, but we suspect there’s more to come on the Rays saga. See individual fact-checks for complete source lists.